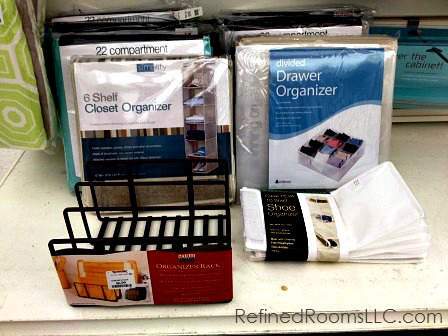 You are here: Home / Organize / By Space / Bedroom / Organizing Products Abound at T.J. Maxx! Welcome! I invite you to sign up to read my blog via RSS (get updates in a feed reader) or via email (get updates delivered daily to your inbox) so you’ll never miss a post! 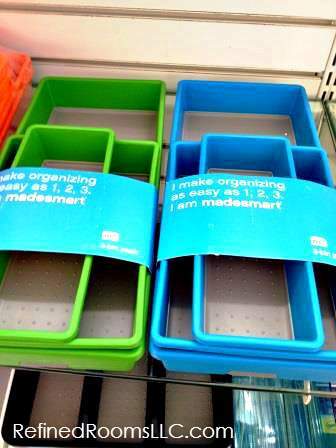 As a professional organizer, It’s part of my job to know the best places to source various organizing products. When you’re looking for containers, products, and tools to corral your clutter and maximize your space, you might explore places like Target, the Container Store, and Lowes. 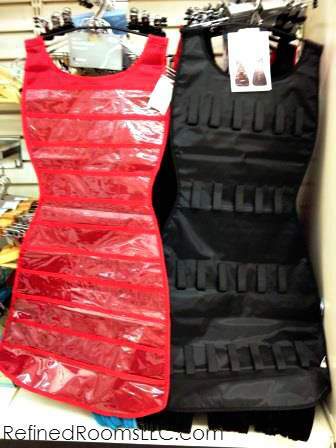 But did you ever think to scour the back aisles at your local T.J. Maxx? You might be very surprised at the treasure trove of organizing goodies you will find. 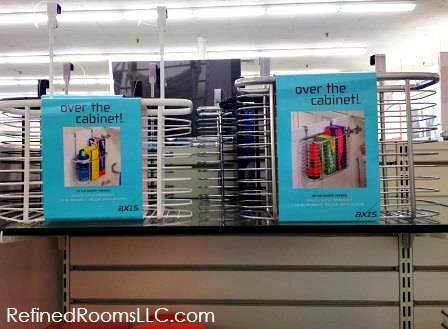 Search those back aisles and you will discover organizing products for every room in your home! 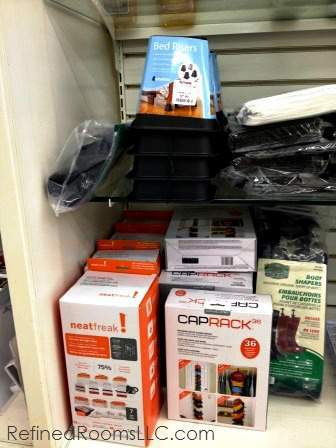 For example, in the aisle featured above, I spied a rack to use in the kitchen cupboard for vertical storage of cookie sheets/cutting boards, a drawer organizer for dressers, a shoe organizer (this product offers a universe of organizing possibilities), as well as a closet organizer for sweater storage. Can you say SCORE?!? So let’s say you are in the process of organizing your bedroom. 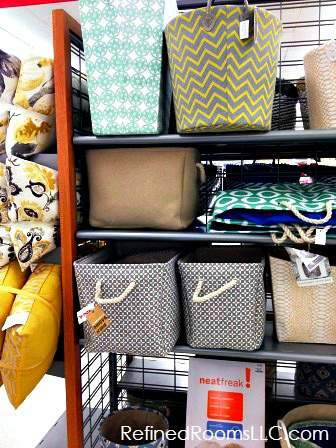 What might you uncover at T.J. Maxx that would be useful for your project? Let’s start out with your closet. 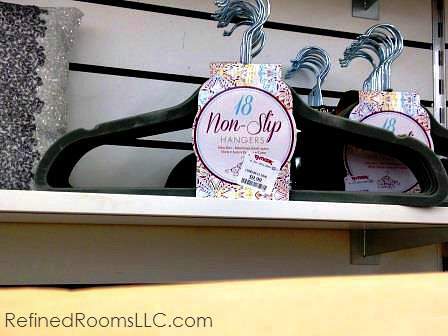 Non-slip hangers are a must for maximizing space in a small closet. In fact, these hangers made my “Top 10 List of Organizing Products”. If you are a regular reader of this blog, you may remember these cute little numbers that were featured as part of the Refined Product Best Pick series. These jewelry and scarf organizers might come in handy as part of your closet organization process as well. You might also find bed risers and under the bed storage containers; these tools would enable you to take advantage of the square footage under your bed for storing off-season clothing, or other items that you access infrequently. The Cap Rack is another nifty gadget for organizing baseball hats in your bedroom closet (or on the back of any door or wall space for that matter). Got a kitchen organizing project in your future? 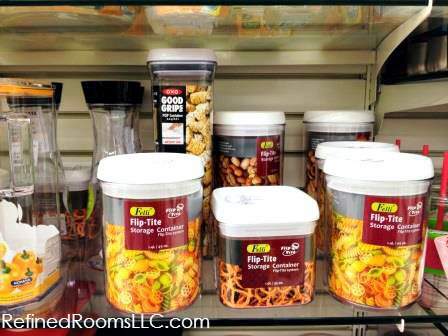 Move one aisle over at T.J. Maxx and you may uncover some hidden gems, such as these plastic dry goods containers for your pantry (although I would recommend avoiding the round containers and selecting the square/rectangular containers instead, since they waste significantly less space). 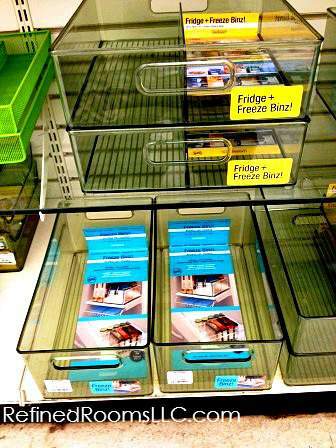 So my heart went pitter patter when I discovered one of my absolute favorite kitchen organizing tools…Fridge and Freezer Binz! Compartmentalizing the food in your fridge and freezer is an easy, yet super effective way to facilitate finding the items that you need quickly. Here’s another nifty kitchen clutter control tool…an over-the-cabinet basket. I love to free up drawer space in the kitchen by using the backs of cabinet doors for storage. This tool makes it easy. (I actually purchased one of these to use in my bathroom to store my hair dryer and flat iron). Last, but not least, are these colorful sets of drawer organizers, which can be used to organize virtually any drawer in your home. 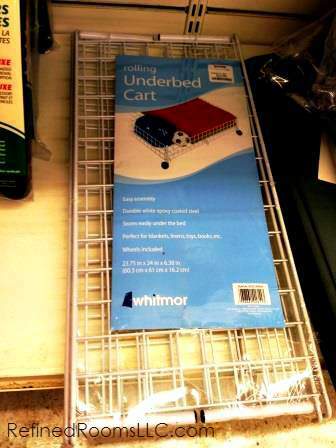 As the packaging states, they “make organizing as easy as 1, 2, 3.”! 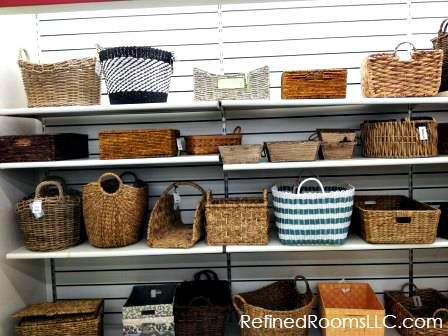 I invite you to explore your local T.J. Maxx (or Marshalls for that matter, since they are basically the same store) and report back here to let everyone know what treasures you discover on your hunt for inexpensive organizing products.